In the old days, meaning more than three years ago, the path to becoming a professional fiction writer was pretty simple to understand. You wrote stories and novels and mailed them to traditional publishers directly. When the story was rejected, you kept the story (or novel) in the mail until someone bought it. Well, not so much anymore. Fiction writers now have that dreaded word: Choice. And so, the path to being a successful fiction writer isn’t so clear anymore. In fact, I would call it downright muddy. So as part of my series here at the end of 2012, looking back and looking forward, I thought I would do an article on the good stuff and the bad stuff you face in getting to a solid career as a fiction writer. Warning: Some of you beginning fiction writers may not like my suggestions or observations. Just remember that there is no right way and there is no one way for all writers to take. I’m just going to try to put some road markers up to keep a few of you out of the ditch. Follow or not follow. It’s your career. Your choice. Let me detail out what I see as the six major paths that a fiction writer can take in 2013 when starting out. 3… Follow the myths that have developed over the last few years. Write a novel, rewrite it to death, pay a gad-zillion bucks to have someone put it up electronically for you and then take a percentage of your work, then you promote it to your 200 friends on Facebook until they start fleeing out of disgust. This path seldom works, but it is part of the promotion myths. 4… Write a novel, learn how to do your own covers and formatting, put the novel up yourself electronically and in POD and then write the next novel and work on learning and becoming a better storyteller. Repeat. Do not promote other than telling your friends once each book is out. This is more of a standard, traditional path that will work, but takes time as you learn how to tell better stories that people want to read. 6… Forget novels completely and only write short stories, selling to traditional magazines as well as publishing indie. This method has a lot quicker feedback loops and is a good way to learn how to tell great stories, but it takes a mind set most beginning writers do not have. And you must learn how to do all the indie publishing work yourself. This method was never a path to making a living writing fiction, but now it is possible if you really, really, really love short fiction. Otherwise, just write a few stories here and there to help your novels. Or you can come up with your own slight variation on those paths. #1 and #3 don’t work unless you get fantastically lucky. #2 and #4 lead to long careers, but take time to build. #5 might get you to making money a little faster, but it will still take years, as it should. #6 only if you love short fiction. Let me list a few of the big ones. These are everywhere, and are mostly flat stupid. But all beginning fiction writers (me included in my day) buy into myths because beginning writers look for the secret handshake, the shortcut, the way to sell books without learning how to write good stories. The truth is that the best way to sell books is write a lot, work on learning how to be a better storyteller constantly, get your work in front of editors or readers or both, and plan for the long haul. But new writers ignore that advice. a) You need an agent to sell a book. b) You need an agent to sell a book overseas. c) You need an agent to sell to Hollywood. d) Traditional publishing gives you better quality in production and editing. e) If you lower your price to 99 cents on your novel, you will make more money. f) As an indie publisher you can’t get your books into bookstores. g) You can pay someone to help you sell a lot of books. h) You need to promote your book. Again, there are many more, but those are what I consider the top eight killer myths. In this high-speed world of the information age, any person can offer an opinion. This blog is no exception. The problem beginning fiction writers face is what to believe, what to listen to, and what to ignore. Now granted, this was the problem when I came in as well back in the 1970s, but now the information is out for everyone to see no matter the source. In my day, we only had to sort out what the established professionals were saying. Now anyone who has a few short stories up can blog about how they did it and what everyone should do. And then add on “information sharing” places like the Kindle Boards and Goodreads and you have information overload. How to solve this problem? I have no easy solution. One suggestion is set up a writing computer that is only for creation of new words. Have no games, no email, no internet connection on that computer. Make it only a writing computer. That way the creative side of things has a line between it and the information overload and opinions flooding at you from everywhere. It honestly will help and be worth the few hundred bucks for a new computer. Second suggestion is to only listen to people who have more than ten or twenty novels in print and who have been in the business for more than twenty years. Also, make sure this person is also versed in both sides of the business of publishing, both traditional and indie. Some of the old professionals still have their heads in the sand and can hurt your worse than listening to a person with a few titles out indie only. Find the balance between the two extremes. Third suggestion is listen to your little voice. If it sounds wrong to you, it might be. But if the advice coming at you makes business sense for you, then explore it. In other words, it’s your career and there are no right answers. Learn to think for yourself. 3) Getting in a hurry. This is the area that is also normal for beginning fiction writers. And I honestly don’t know the reason why, but I was no exception to this problem when I started out. Now, with the indie publishing, this problem is no longer hidden in each writer’s office, but is out on full display for the world to see. When watched from the outside, and from a point of distance like I now have, this all seems laughingly funny to me. I watch new writers, who have managed to complete their first novel, promoting the life out of their “book” because they believe they should, and then complaining when there are very few sales. A first recital piece is not a professional piece of work. But new writers sure think it is. All fiction writers, at some point, given enough time, start to understand that to become a good storyteller it takes time. John D. McDonald said every fiction writer has a million words of crap in them before they reach their first published word. I agree and could go on about why this is so, but don’t have the time in this article. Some writers work out those early words in other ways. Orson Scott Card wrote ten years of plays before trying and selling his first short story. I did my early words all by writing fiction, right from the start. And for writers who do it my way, my pace was pretty normal in hindsight. So I believe I started really writing in 1982 and it took me five years of intense work, sometimes a short story per week. I also focused heavily on learning in those five years while I got to my million words and started to sell decent numbers of copies. So one of the worst problems new fiction writers have now is that inability to see that the fiction writing profession is an international profession and it takes years to learn, both on the craft side and the business side. Another way of looking at it is a person who wants to be a lawyer hangs out a shingle and tries to get cases while he is a freshman undergrad in college. Laughable, right? And you are promoting your first written novel? The solution to this is take a deep breath, focus on the writing and learning to write better stories and put the books out either indie or to editors or both and leave them alone. If you get a few buyers, great. If not, no big deal. Trust the audience and the editors to decide when you have graduated to professional-level storytelling. I’m going to give flat out advice right now. Please understand this is only my opinion and please take or leave what you want. 2) Spend 15% of your time on learning craft and business. Both a little at a time. In any way you can. The writers who follow my suggestions are following a path well-worn by generations of professional writers. All of us did it just slightly different in the details and time depending on our background, but we all walked that same basic road. 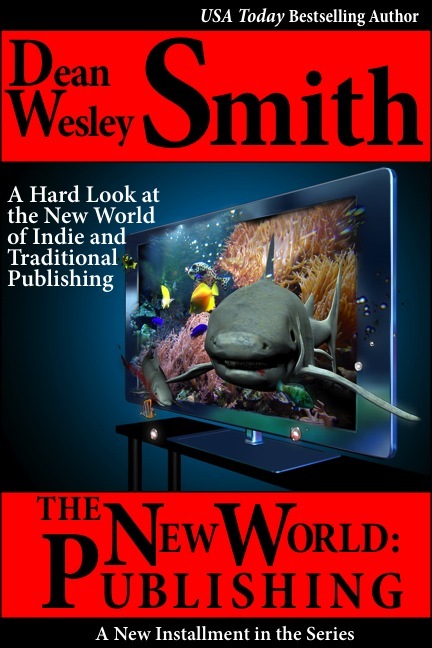 Even with the indie publishing side of things, which can help cash flow a little, this new world has not varied from the time it takes to learn how to tell a decent story. Telling a good story is an art form. As with any art, the art takes time to learn. Make writing new words your main focus. Make learning business and craft your secondary focus. And get your work out for people to read. It really, honestly, is that simple. This chapter is now part of my inventory in my Magic Bakery. I’m now getting back to writing fiction, so every word I write here takes time from that. And I have to justify this column somehow in how I make a living. So, if you feel this helped you in any way, toss a tip into the tip jar on the way out of the Magic Bakery.